How The Battle Over Elián González Helped Change U.S. Cuba Policy : Parallels A pivotal international custody dispute over a 5-year-old boy unfolded 15 years ago, and helped pave the way to normalizing U.S. relations with Cuba. 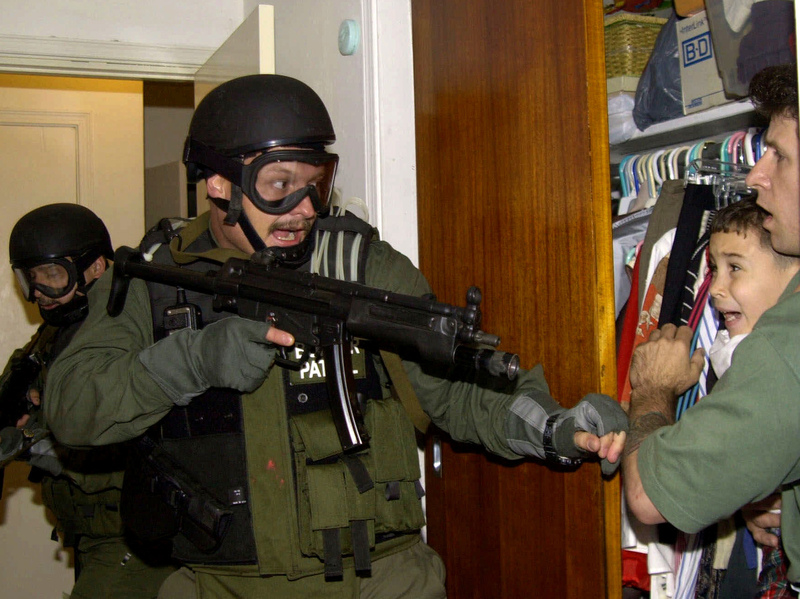 Federal agents seized Elián González, held in a closet by Donato Dalrymple, in Miami in April 2000. Dalrymple rescued the boy from the ocean after his mother drowned when they tried to escape Cuba. Sunday marks the 15th anniversary of the end of the Elián González drama — the international custody battle that gave the cable news networks bizarre fodder for seven long months in 1999 and 2000. Elián was a 5-year-old boy found drifting off the Florida coast after his mother drowned during their attempt to escape communist Cuba. Miami's anti-communist Cuban-American leaders demanded Elián be allowed to live with relatives in Miami. The boy's father wanted him back in Cuba. So did Cuban leader Fidel Castro. International law was on Cuba's side. Which is why that Easter weekend, U.S. agents had to seize Elián during a controversial raid on the Miami family's home in Little Havana. 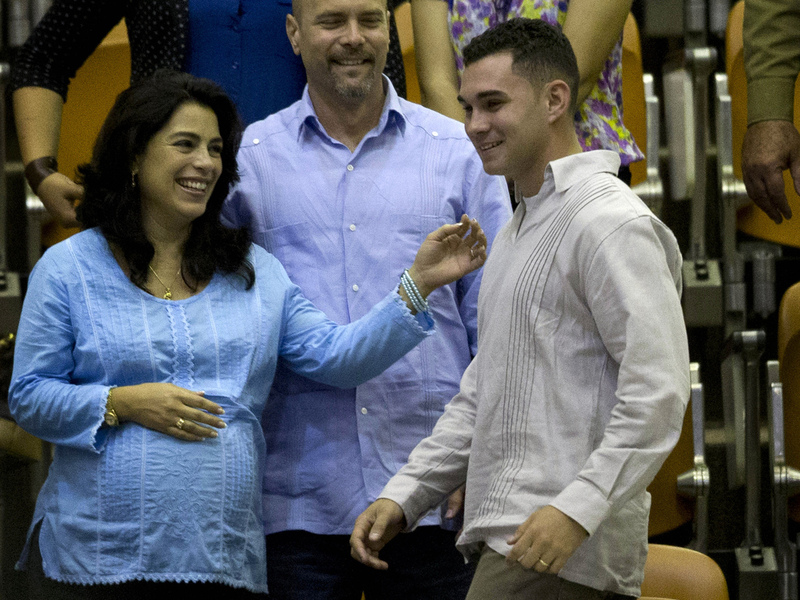 Two months later, on June 28, all the court appeals ended and Elián returned to Cuba. In his wake, he left a Cuban-American community in disarray — but more poised to update its geopolitical outlook. "It was a pivotal event," says millionaire Miami businessman Carlos Saladrigas. "It changed the whole dynamic of the Miami community. It changed me." Saladrigas was one of the hardline Cuban-American leaders involved in negotiating Elián's fate with the feds. But when it was all over, he says he and many others began some serious soul-searching. "I remember having a meeting with Cuban-American leaders where we were reassessing what happened to us — what hit us," Saladrigas told me. "We didn't realize how much damage we were doing to ourselves and to our image." No one denied then that the collective humanitarian impulse to aid Elián was admirable and impressive. And no one denies it today. But another motive can't be denied, either. By refusing to hand the boy over, Cuban-Americans had hoped to humiliate Castro. The world called Miami a banana republic. Critics said the Cuban-American community's intolerance — and the way it turned a traumatized child into a political football — was more reminiscent of none other than ... Fidel Castro. "This child became a trophy," says Elena Freyre, who today heads the Foundation for Normalization of U.S.-Cuba Relations. "It was horrendous, truly." Freyre received anonymous death threats for advocating Elián's return to Cuba. But she and many others agree the episode's most disturbing moment was a video the Miami relatives made. In it, an obviously coached Elián tells his dad he doesn't want to come home. That display helped turn the rest of America against the Cuban-American community. And in a larger sense, it helped make the country question for perhaps the first time the U.S. policy of isolating Cuba, including the trade embargo. González, pictured here in Dec. 2014, at the closing ceremony of the legislative session at Cuba's National Assembly, is 21 now and an engineering student. "For the first time, the national media was looking at the Cuban-American community," says Freyre, "and it turned out to be very negative. Here in the U.S., it made [people] realize that maybe this was not necessarily the most rational way to go." That in turn began to have its effect inside the Cuban-American community. "One the one hand, Elián brought Cuban-Americans together," says Guillermo Grenier, a Cuban-American sociologist at Florida International University in Miami and author of Legacy of Exile: Cubans in the United States. "On the other hand, it showed Cuban-Americans that they were part of a bigger picture in the dynamics of U.S.-Cuba relations." As a result, the Elián disaster brought more moderate Cuban-American voices to the forefront, including younger, U.S.-born Cuban-Americans and more recently arrived Cubans who have stronger ties to the island than the traditional exile cohort does. Saladrigas started the Cuba Study Group in Washington, D.C. It promotes engagement with Cuba, believing it's a smarter way to bring change to the island. Elián, he says, "forced us to understand that we were not [being] strategic. That while Cuba was playing chess, we were playing checkers." Polls after Elián showed growing Cuban-American support for changes in Washington's Cuba policy. And that's played a large role – maybe the largest role – in bringing us where we are now: President Obama's historic normalization of relations with Cuba, which were severed in 1961. Meanwhile, Elián, who today is a 21-year-old engineering student in Cuba, was recently interviewed there by ABC News. When he was asked what country he'd like to visit, "Los Estados Unidos," he said.